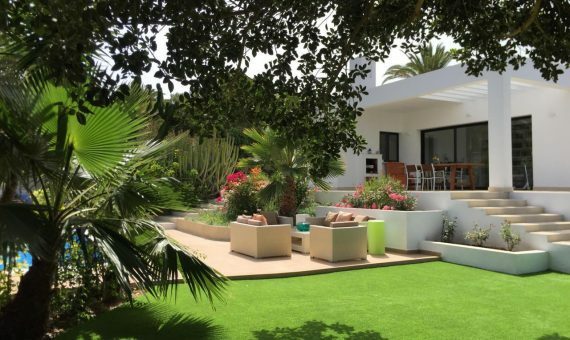 8 bedroom villa located in the heart of Golf Costa Adeje, one of the most prestigious areas of southern Tenerife. The property located on a plot of 727m2 is divided into 2 floors. The upper floor consists of 4 bedrooms all with private bathroom and exit to the garden, bright and spacious living room, fully equipped kitchen and beautiful porch with fireplace and view of the pool. The ground floor consists of 4 bedrooms 3 bathrooms and small living room, there is also a garage for 3 cars, storage room and cellar. In the garden surrounding the property there is a heated pool and barbecue area. 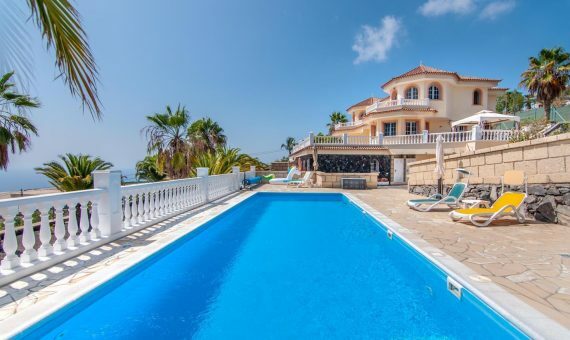 The Villa has a walkable roof that can be reached from an external staircase and from where there is an unbeatable view of the ocean and the neighboring islands and the golf course.